Guadalupe Salinas watches a video about the PSJA Nursing Career Pathway Program during a ceremony honoring her graduation with seven other students Thursday, May 18, 2017, in Edinburg. The eight students are the first graduates of the program. 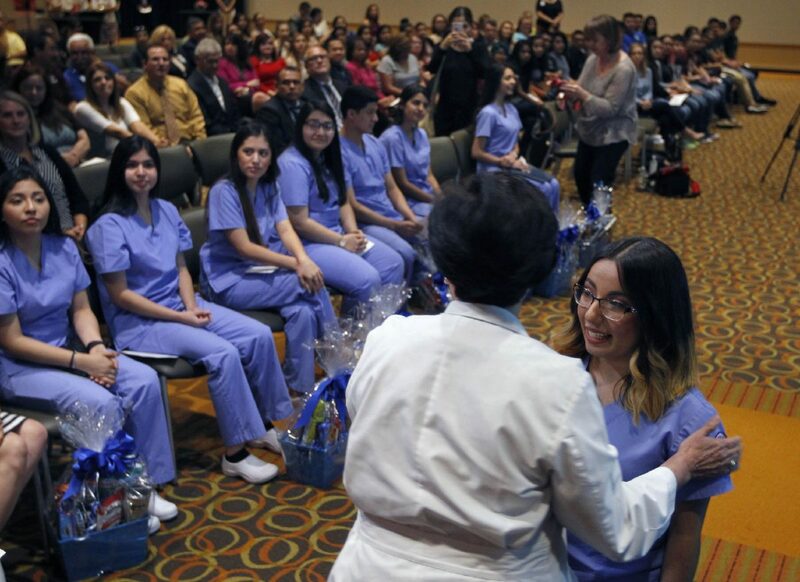 EDINBURG — With their high school graduation scheduled for this weekend, eight Pharr-San Juan- Alamo school district students are the first in the nation to receive an associate degree in nursing before their high school diploma. “All of the patient interaction and learning the course material, I thought it was very interesting, and it secured my belief that I want to do something in medicine,” said 18-year-old Iris Garcia, who was one of the eight to receive her associate degree and is moving on to the University of Texas at Austin to seek a degree in biochemistry. Her goal is to one day become a pediatric geneticist, which she said she learned about while in the program. About two years ago the PSJA Independent School District partnered with South Texas College and Doctors Hospital at Renaissance to launch a program that would allow a small cohort of students to be the first to complete the associate degree in nursing along with their high school degree. Abigail Villarreal, right, is congratulated by Dr. Melinda Rodriguez during a ceremony honoring high school students who completed PSJA ISD's Nursing Career Pathway Program Thursday May 18, 2017 in Edinburg. Eight high school students graduated with a nursing associates degree from STC in the dual-enrollment program. 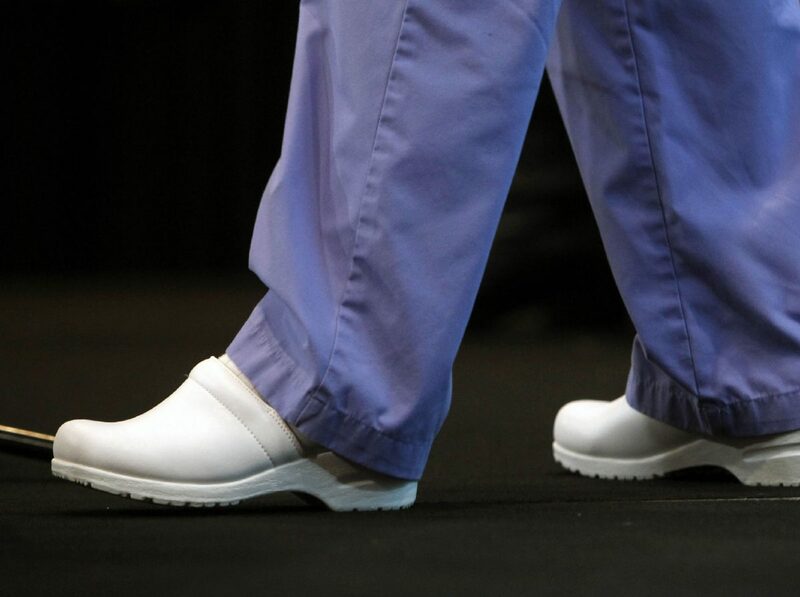 Guadalupe Salinas wears her nursing shoes during a ceremony honoring graduates of PSJA ISD's Nursing Career Pathway Program Thursday May 18, 2017 in Edinburg. 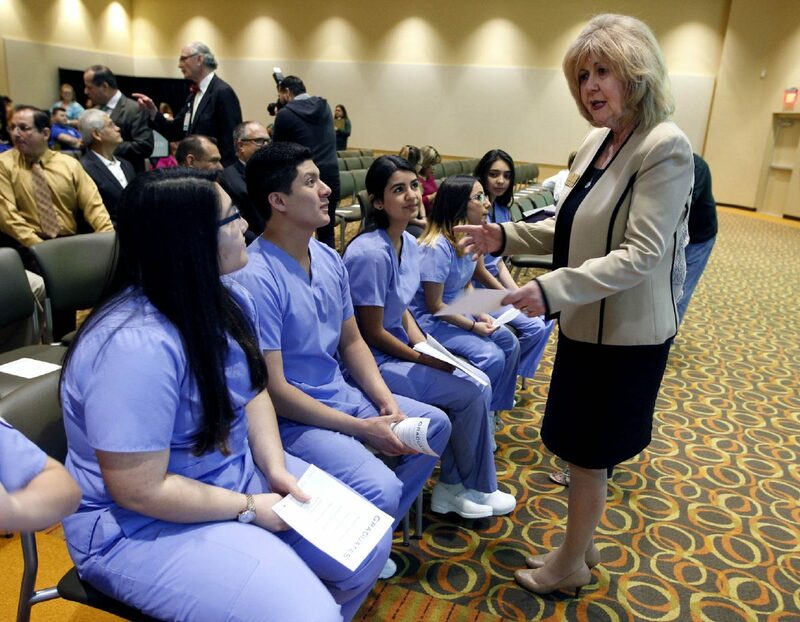 STC president Shirley Reed talks with students Iris Garcia, left, Luis Silos and Guadalupe Salinas before a ceremony honoring the students of PSJA ISD's Nursing Career Pathway Program Thursday, May 18, 2017, in Edinburg. Garcia along with her seven classmates, were presented with DHR pins and welcomed to the hospital’s family during a ceremony Monday, where they also had the opportunity to announce their college picks. Like Garcia, all of the class members plan to continue their college education. After much preparation and many meetings with the Texas Board of Nursing, the pilot program was approved and about 20 PSJA ISD students out of a cohort of 54 students who had been taking prerequisite courses were qualified to join. But the rigor of the curriculum and exposure to what it is to actually work in the field through practice in the hospitals, only eight achieved the final goal. Valerio met with the board to answer questions about the program and said their main concern was about the maturity level of the students. But he was able to defend the intent of the program and said there are no studies proving that students are less mature or physically prepared to undertake the task. The students undertook the same coursework as any other nursing student, but because the application guidelines specify that a high school degree was needed, the college needed to get approval to change it for this program. Valerio is now getting ready to present the outcome of the initial cohort to the board in October, he said, and if it is approved, they will be able to continue offering the associate degree to high school students. Part of the challenge is making sure the students are able to complete the requirements for the associate and high school degree, scheduling times for the classes and, in this case, aligning three institutions that oversaw the program. PSJA ISD Superintendent Daniel King said it only made sense to expand dual enrollment programs that offer associate degrees to include high-demand and high-paying fields such as nursing. “Any of the areas where here in the Valley we have high-skill, high-need jobs or there are industries or sectors that are either short or want to move here but they are saying the workers are not there, we can work together with EDCs, private sectors,” King said, adding public-private partnerships are the way to go in order to create these types of opportunities. For Iris Garcia’s mother, Elizabeth Garcia, pushing her daughter to enroll in the program was a no-brainer, she said. From a young age Iris had expressed curiosity in the medical fields and she knew this program would open doors.